Lifdek Corporation, an innovator of site-assembled corrugated paper pallet technology, has completely exited box type pallets. 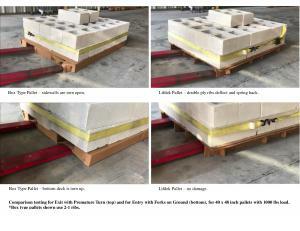 Lifdek is now offering its new Lifdek™ skid type pallets exclusively after being proven the superior shipping platform. ORLANDO, FL, USA, December 5, 2017 /EINPresswire.com/ -- Box type pallets are corrugated paper pallets that have both outer perimeter sidewalls and a bottom deck, thereby resembling boxes. Lifdek started its initial product offerings more than four years ago with its patented box type pallets and assembly machines. The box pallets provided on-site, machine assembly for users in as little as 30 seconds. Lifdek invested a tremendous amount in developing and promoting this technology, but decided to reboot with “pallet 2.0” after underestimating the pallet abuse realized in the logistics supply chain. Four years later, Lifdek made the very difficult decision to vacate the box type pallets in favor of the much tougher skid type pallets. Joseph Danko, president said, “We developed a tougher pallet design to address the box type pallet shortfalls. Our new skid type pallets are a far superior shipping platform because they lack the two elements most likely to get damaged in transit: pallet sidewalls and bottoms. We then took the board required for those elements and put it to better use with two additional two-ply ribs and a double thickness top deck for maximum support.” In addition to these benefits, the new pallet design eliminated the necessity of a machine to reach their goal of 120 pallets per hour; $200 assembly jigs are now used rather than requiring expensive machinery. Lifdek pallets were originally developed to address the needs of the largest section of the pallet market, fast moving consumables. Incoming pallet freight and pallet storage costs are reduced by nearly 90% because Lifdek pallets are received and stored flat. Lifdek pallets are recycled by the end receiver with other used corrugated boxes, generating recycling revenue while eliminating staging, storing and loading costs required with wood pallet retrieval. At only eight pounds, Lifdek paper pallets offer substantial air and freight savings billed by weight, and are a safer alternative for employees and retail customers. This one-way shipping approach also eliminates the chance of cross contamination from prior use, providing substantial safety benefits for grocery and pharmaceutical applications. Lifdek licenses its pallet technology to box manufacturers and packaging companies worldwide, which produce the die cut blanks for their own use as well as their local customers. Lifdek’s business model allows Lifdek pallets to be produced and shipped locally anywhere in the world, providing the most cost competitive corrugated pallets anywhere. Lifdek licensees have access to over a hundred pallet sizes and designs, with new sizes readily available to accommodate a company's specific requirements and applications. Lifdek is a developer of corrugated pallet technology that enables companies to reduce pallet related costs and liabilities while offering safe and sustainable shipping platforms. Lifdek pallets can be uniquely and completely assembled on-site prior to use. The patented pallets are available worldwide.